Now in downtown Boston, at the corner of Washington and School Streets, we find the Old Corner Bookstore, one of the most important spots in Boston's eighteenth-century literary scene. It was here that (William) Ticknor and (James T.) Fields made their name by publishing the great American writers of that period: Hawthorne, Longfellow, Emerson, Thoreau, and others. That firm would later become Fields, Osgood & Company and finally, after merging with Henry Houghton's Riverside Press in Cambridge, Houghton, Mifflin & Company. The building was built circa 1712 by Thomas Crease, an apothecary. Historic Boston purchased the building in 1960. 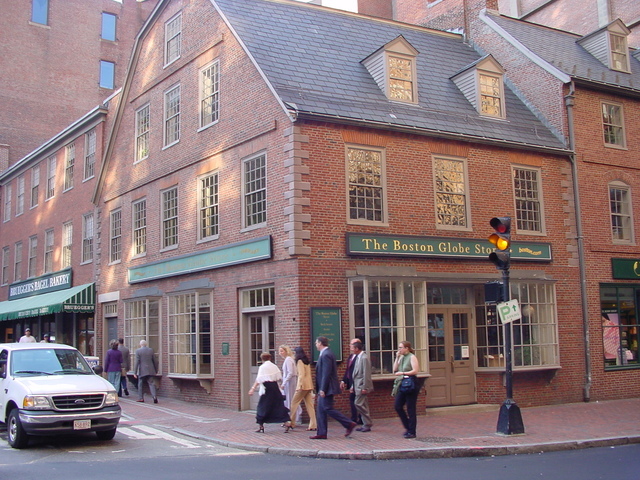 It was later the home of the Globe Corner Bookstore, a specialist map and travel-book dealer, which still survives in Harvard Square, Cambridge, and most recently the Boston Globe store, which had just closed when I visited in 2004.